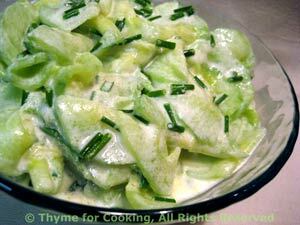 Creamy Cucumber Salad, Thyme for Cooking summer essential salad. Stick the whole cloves into the onion half. Put the studded onion in the bottom of a deep bowl large enough to easily hold the cukes. Put in a layer of cukes, sprinkle with salt, and repeat 3 times using about 1 tsp salt on each layer. Put a small plate or saucer on top of the cucumbers - it should be sitting on the cukes, not the sides of the bowl. Put a big can or jar of something heavy on the plate - to weigh it down. We want weight on the cukes - the plate is just to distribute it more evenly. Let it sit at room temperature for 4 - 10 hours. Put cucumbers in a strainer - discarding onion and cloves. Rinse cucumbers (remember all that salt?) You don't want to get all of the salt off - just about 80% Taste to test. Add 1/3 cup yogurt , stir and taste. Adjust to the quantity of cukes and your liking. This will keep a week, but it never lasts that long at our house.